Following the withdrawal of the Safran ocean racer skippered by Marc Guillemot shortly after the start of the Vendée Globe round-the-world race, a group of three Safran specialists, in mechanics, quality and materials & processes, worked with everybody involved in development of the boat’s keel (naval architects, designers and manufacturers) to determine the causes of the broken keel. The specialists analyzed the break in the keel’s fin by microscopic observations to determine the failure mode. Samples were also taken from the metal to check if its characteristics matched the values used for strength calculations. At the same time, other experts calculated the loads experienced by the keel, based on observations of the break, and compared them to the standard loads used as a basis for its design. The investigation was able to exclude the possibility of a break due to a collision with an “unidentified floating object”. It also noted that there were no metallurgical defects, and that the welds showed no anomalies that could explain the break. The investigation shows that the break was due to damage caused by metal fatigue, engendered by repeated shocks from contact with waves. There are no indications of a high-frequency vibration phenomenon. A close look at the break spotlights the high loads due to the extreme sea conditions experienced by Safran over the last year, during the Transat Jacques Vabre 2011, the 2012 Round Britain race, and training runs for the Vendée Globe. The analysis confirms that the loads experienced by the keel were undoubtedly far higher than the standard values used by the design teams, as well as the values calculated from the shock recordings during the Transat Jacques Vabre 2009. 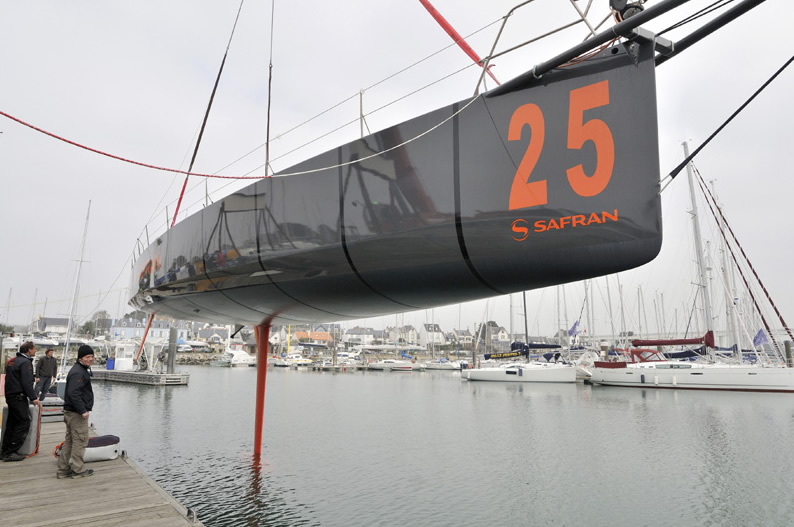 Safran will take advantage of the lessons learned through this investigation to design a new keel and work with Marc Guillemot to prepare for the next major race, the Transat Jacques Vabre 2013. Safran will of course make available all conclusions of this investigation to the IMOCA (International Monohull Open Class Association) Technical Committee, so that all shipowners and skippers can benefit from the lessons learned.